It was down to the last two minutes of the game. Neither team had been able to net any goals after 70 minutes of play, and most in the crowd were expecting a penalty shootout to determine the result. But the Soccer Girls’ team, true to their motto, continued believing till the end. Then, in one fell swoop, Captain Khue deftly threaded a leading pass to winger Koo Huifen, evading the strong Meridian defence. Receiving the ball, Huifen swiftly took what was practically Raffles’ first shot on goal in the entire game and propelled the ball past the Meridian goalkeeper and into the back of the net. The Raffles crowd erupted in cheers of relief and joy, a fitting culmination to a match of tension, excitement and high drama. In beating Meridian Junior College 1-0 in such dramatic fashion, the Raffles Soccer Girls had, for the first time in their history, clinched the A Division title. Four-time defending champions and soccer powerhouse Victoria Junior College had lost to MJC in a tightly fought semi-finals making Raffles the firm underdogs in the finals. 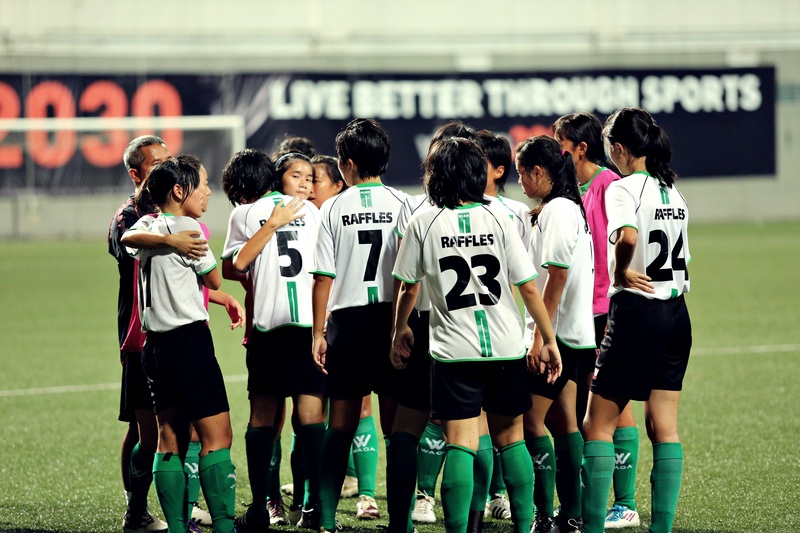 Having placed 4th last year, the RI team had trained hard for this match, and were rewarded for their dedication and self-belief with a hard-won victory at Jalan Besar Stadium on 8th May 2012. For most of the game, MJC’s players put up a remarkable fight, dominating possession of the ball in RI’s half of the field. While RI’s players displayed skillful control of the ball, they repeatedly found it difficult to get out of their own half, due to MJC’s dominance and effective pressing strategy. Tension was high as the clock ticked, without any goals from either team. 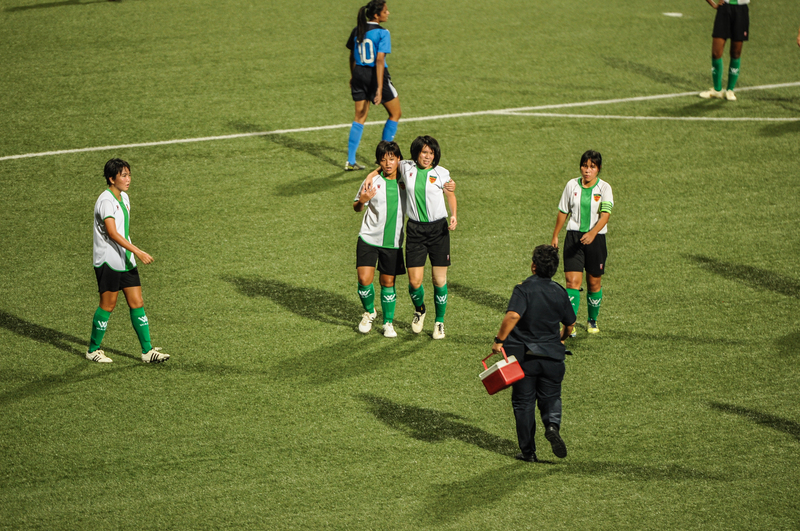 RI’s Samantha Tan suffered a minor injury and limped off the field while supported by her teammates. However, she was back on the field shortly after, prompting a two-minute injury time extension, which was what ultimately determined the result of the game. 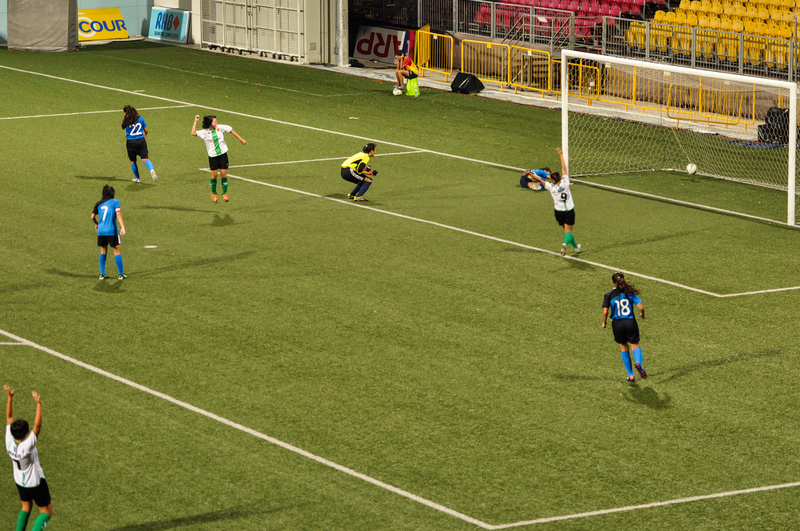 While MJC’s strong attack enabled the team to take more than a few shots at the goal during the game, RI goalkeeper Choo Yun Ting wowed the crowd with her calm and collected saves as she positioned herself strategically along the goal line, with the ball seeming to sail into her arms whenever it entered the penalty area. She was ably assisted by a stalwart defensive effort from the entire RI team, before their hard fought resistance was rewarded with a rare counter attack that broke Meridian’s hearts. On the team’s victory, Captain Tran Thi Thai Khue said: “We fought very hard. Although they (MJC) attacked a lot, we really defended with our hearts.” Indeed, the team’s spirit and chemistry was evident, both on the field and off, as the footballers spoke to us. “The thing that sets our team apart from others is that we believe till the end…even till the last two minutes. Our teamwork is based on love and trust, and we played as a team, for each other.” said Cheng Lynn. Despite many of our players having played for “only a year” and having no DSA players, unlike other schools, the RI Soccer girls showed collective belief in their team that ultimately led them to a glorious victory in this year’s football championships.